VPN UK is a VPN service designed for expats who want to watch streaming TV shows from abroad. The service was launched by a UK based company and it has been around for few years. This VPN UK review will highlight the pros and cons of the service and reveal whether it is worth subscribing. Server Locations & Site Access – Since VPN UK is primarily targeted towards expats, the company has decided to deploy gateways at just two locations – United States and United Kingdom. The service gives you an opportunity to access IP restricted premium services such as iTV Player, HBO Go, Hulu, BBC iPlayer, USA Network, Sky Go, ABC Player, Lovefilm, Amazon Prime, Eurosport, MLB, Xfinity, UK TV, Demand 5, Vevo, MTV, NBC, Netflix, STV, Vudu, CWTV, Pandora, NHL, CBS, TNT, FOX and 4OD from any part of the world. In addition, you can use the service to bypass censorship at foreign locations (especially China, Brazil, Dubai, Qatar, Saudi Arabia and Thailand) and unlock popular sites like Twitter, Skype, Facebook, Viber, Gmail and YouTube. VPN UK even offers multi-country plans so it is possible to unlock local content from both UK and US with just one subscription. VPN Speed & Bandwidth – VPN UK offers a fast and reliable service through its high quality network. The company offers metered as well as unmetered plans (subject to fair use policy of 20 GB per month) so customers can stream HD shows, watch live sporting events, download files and play games without worrying about speed or bandwidth restrictions. Privacy Settings – VPN UK provides 128 bit encrypted connections to customers. The service is delivered via the PPTP protocol which is compatible with most systems but is not considered very secure. The data encryption and tunneling protection ensures that your data, money and identity remain safe from hackers while you are using a Wi-Fi hotspot at a mall, coffee shop or airport. In addition, the service protects you from surveillance and monitoring conducted by ISPs and security agencies. Like most VPN providers, VPN UK does not record online sessions of subscribers. However, if a customer violates terms of service or uses the service for unlawful activities, the company reserves the right to reveal his details to law enforcement. Supported Operating Systems – VPN UK works flawlessly on desktops and mobiles running on iOS (iPads, iPhones), Windows (Vista, XP, 7, 8), Linux and Android. Since there is no VPN dialer client provided by the company, you need to set up the service manually or use the desktop shortcut (supplied by the support team) that configures the service with one click. Unlike other VPN providers, VPN UK only offers dedicated IPs to its customers. Customer Support – VPN UK provides support via tickets and emails. The support staff is based in UK and the company promises to respond to all queries within 12 hours. 1) US + UK Unmetered – Dedicated US and UK IPs; unlimited bandwidth; costs £9.99/month, £24.99 for 3 months and £44.99 for half year. 2) US + UK Metered – Dedicated US and UK IPs; 10 GB monthly bandwidth; available for £7.99 per month. 3) UK Unmetered – One dedicated UK IP; unlimited bandwidth; costs £7.99 per month, £19.99 per quarter and £34.99 for 6 months. 4) UK Metered – One dedicated UK IP; 5 GB monthly bandwidth; costs £4.99 per month. The company offers a fully functional 30 minute free trial (with 50 MB data limit) so you can test the service before making a purchase decision. The company even offers refunds to those who are not able to use the service. Final Verdict – VPN UK is certainly a good option for those who are deprived of their favorite entertainment options at foreign locations. The service may not offer the highest level of privacy but it definitely excels as a content unlocking solution. We recommend that you check out the free trial offered by the company and subscribe to a full package if you are happy with the speed and privacy on offer. For more information, please visit: www.vpnuk.co.uk. 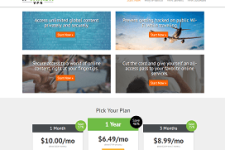 FinchVPN Review – What To Expect From This VPN Service? 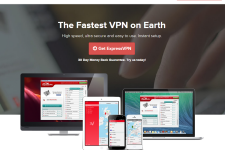 GlobalVPN Review – Is The Service Worth A Look?